Kellogg Community College will officially welcome students back to campus for the Fall 2017 semester next week during Bruin Blast, the College’s annual fall kick-off event for students. 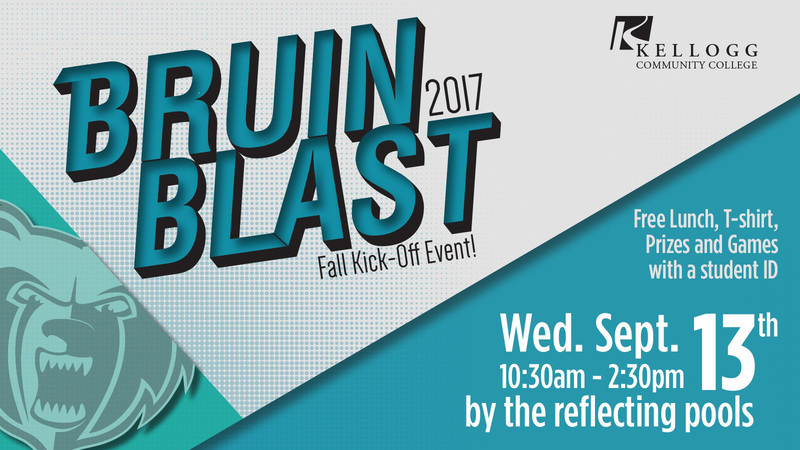 Bruin Blast will be held from 10:30 a.m. to 2:30 p.m. Wednesday, Sept. 13, around the reflecting pools at the front of KCC’s campus at 450 North Ave., Battle Creek. The event is free and open to the public, but giveaways – including free lunch and free KCC T-shirts – and prize drawings will only be available to students with a current KCC ID. College staff, student leaders and representatives from various community organizations will also be on hand to provide information about KCC departments, student organizations and community resources. KCC students who need a student ID card can find information about obtaining one on KCC’s Identification Cards Web page. For more information about Bruin Blast or other Student Life events on campus at KCC this fall, contact Student Life Manager Drew Hutchinson at 269-965-3931 ext. 2600 or at hutchinsond@kellogg.edu. KCC’s Fall 2017 semester began Aug. 31. Students and prospective students who are seeking advice on courses and programs for the Spring 2018 semester, which begins Jan. 12, 2018, can contact Academic Advising at 269-965-4124. Registration for Spring 2018 semester classes opens Oct. 30.